According to Ad Week, marketing is undergoing radical changes in the next 5 years with over one third of CMO's investing 75% of their marketing budget in digital marketing. This can create a problem for small and medium sized businesses, especially if they have not considered going digital yet. If your traditional marketing is currently working, that's great. The real question is will it be working in the next 2 to 5, or 10 years? With many companies establishing themselves in the digital world, small and medium sized businesses have to gain a foothold in the online world before it's too late. 2. 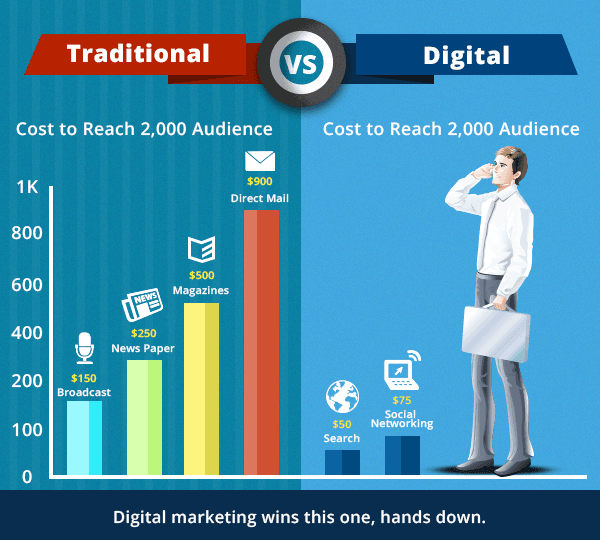 Digital is Cheaper than Traditional Marketing. Yup, and it can be much cheaper. According to seriouslysimplemarketing, potential reach to an audience of 2,000 people can cost upwards of $900 through direct mail. The cheapest option of reaching that audience of 2,000 people through traditional marketing will cost $150 via radio. On the other hand, reaching an audience of that size through digital means can range from $50 – $75 dollars. Now let's increase the size of the audience, if your business wanted to target 10,000 people, you would have to spend $4500 on direct mail, and in between $250 – $375 on digital ads. The cost effectiveness of digital marketing makes it much more desirable for any business owner to shift their marketing strategies online. The ability for the potential customer to contact your business is diminished with traditional marketing. Connecting with customers, and replying to their inquiries on a public form for everyone to read is something you won't find in traditional marketing. Continuous engagement with your audience on a public platform such as Facebook or Instagram creates loyal brand ambassadors. Higher customer engagement increases brand awareness, and strengthens your brand reputation online. The cost to switch increases every day. The cost to change your marketing is the cheapest it will ever be. As the effectiveness of digital increases, so does the cost. Shifting to digital marketing today can save you time, money, and increase potential reach and customer engagement on a public platform. The sooner you commit to the shift, the more likely your small to medium sized business will have a foothold in the digital world. If you are feeling overwhelmed, or don't know your next steps, we can help! You can schedule a free 25 minute digital planning session and we'll tell you exactly what you should be focusing your efforts on. Send us an email with the form below! We are based on the principle that small to medium-sized businesses and organizations, focused on local markets should have access to the same kinds of marketing tools and talent that global enterprises use to find and deliver nurtured customers to their door.